Will ring of steel stop migrant crime? 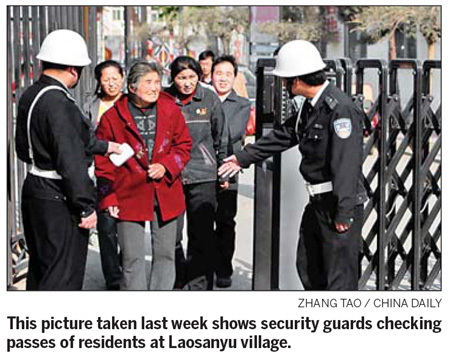 He Na goes behind barriers at Laosanyu village in Beijing. From outside, Laosanyu looks like a military base or a prison. There are tall metal fences and high walls surrounding the community, and its only entrance is guarded 24 hours a day by men in uniform. Peek through the 2-meter-high bars, though, and this austere illusion is all but shattered by the typical sights of a Chinese village: Residents relaxing in the shade, dogs excitedly chasing a chicken on a dirt road. Yet the heightened security is part of controversial moves by authorities in Daxing, a southern suburb of Beijing, to curb rising crime rates in areas with large migrant populations. Laosanyu, which is made up of 90 percent migrants, is just the first of 16 communities that will be fenced off as part of the district government's fengbi guanli (literally "sealed management") system. Under the program, residents not only have to show passes to get through the ring of steel around the 7-hectare village, teams of volunteers also patrol the streets several times a day, while newly-installed closed-circuit cameras sweep the area for suspicious activity. "If this system effectively improves public security, we will promote the method to the rest of the villages in the city," said Zuo Baoshuan, an official with Daxing public security bureau. "The entire process is expected to be finished in June." The project has drawn applause and outrage in equal measure. "The number of thieves is extremely high in the summer and during Spring Festival," said resident Wang Guiying, a woman in her 60s. "The sealed management adds additional security and good people are not afraid." Her neighbor Wei Junjing agreed and added: "If a pass card could bring security to me, why not try this way." However, critics say the new measures are discriminatory to migrants - who are often accused by officials of being responsible for the majority of crime in city suburbs - and threaten civil rights. 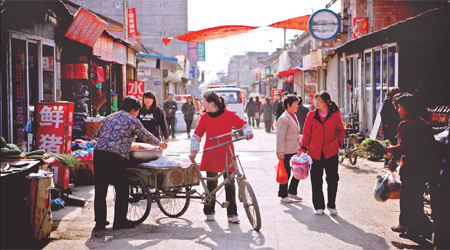 "Closing off the village will do nothing but harm," said Yuan Chongfa, deputy director of the National Development and Reform Commission's research center for small towns and cities. "This move not only closes the door on migrants but also on future development. This could even damage the city's image." As the area south of the capital has developed, the migrant population in Daxing has ballooned. The district now has five towns where migrant residents outnumber those with hukou. "Ours is no longer a village in a traditional sense," said Wang Changxiang, Party secretary of Laosanyu, where only 612 of 7,000 residents have hukou. "Six years ago, two street cleaners were enough for the entire village. Now we have to hire 13 to deal with at least 12 tricycles of garbage a day." The influx has also been a boon for local businesses, particularly landlords. At least 180 of the 185 households in the village rent their homes. Yet authorities say the increase in migrants has also led to a spike in crime. Over the last five years, 80 percent of all crime in the district has occurred in one of these five towns, with at least 80 percent committed by migrants, according to Daxing's office of general services. "During Spring Festival this year, there were eight burglaries in one night," said Guo Ruifeng, head of Laosanyu village. Beijing is toying with the idea of closing off those villages where most residents are migrant laborers. The gated and walled-in communities will be open from 6am until 11pm. People will be able leave during other times only in extraordinary circumstances. ..
Senior Beijinger makes recycling in neighborhood her personal mission. UK police must verbally administer the below statement to arrest a suspect.